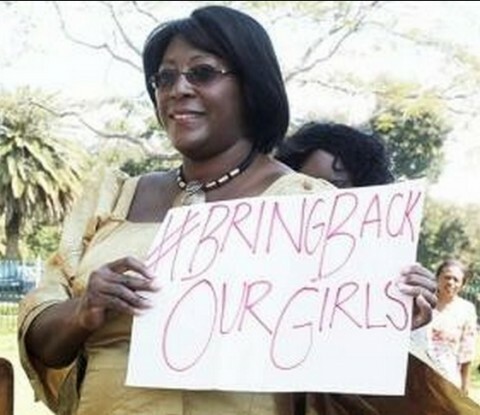 FIRST Lady Christine Kaseba yesterday resounded the twitter hash tag that has become an international slogan and plea, drawing focus to the more than 200 Nigerian girls being held captive by the militant group, Boko Haram. “Bring back our girls!” Dr Kaseba demanded unreservedly, in a call for the immediate release of the Nigerian school girls.Scores of people of various religious and political affiliations turned up in a moving show of solidarity at Lusaka’s civic centre for the rally organised by Zambia Cares Alliance.Vice-President Dr Guy Scott,and his wife, Dr Charlotte as well as Minister of Tourism and Arts, Jean Kapata, and Minister of Chiefs and Traditional Affairs, Nkandu Luo were also in attendance.Carrying a placard that read, ‘#Bring back our girls,’ the First Lady delivered an emphatic address.“Tell the world that we in Zambia care. We the Zambian Christians, Moslems, Hindus and Buddhists care because we in Zambia believe in peace,” Dr Kaseba said.She asked those in attendance to take a moment for individual prayers on behalf of the Nigerian girls.“Pray, tweet, send that twitter message to God, send that SMS to God,” Dr Kaseba said.Her appeal also went to all peace-loving Zambians to respect the religious views of the Moslem community in Zambia.“We are all Zambians and we must remain united. We must move with the strength that we have and must be proud of who we are. Let us not sacrifice our national values,” the First Lady pleaded.She said Zambians understand the importance of peace and can only imagine the anguish, fear and frustration the families of the abducted girls are experiencing.Everywhere in the world, Dr Kaseba shared, the underlying theme is condemnation of the abduction.Islamic Council of Zambia (ICZ) general secretary, Sheikh Shaban Phiri said that the religion of Islam, which is peaceful, has been misrepresented by the terrible activities of Boko Haram.Vice-President Dr Scott also asked Zambians to accommodate members of the Moslem community and not harass them.UN resident coordinator, Janet Rogan said Zambians were showing specifically that they care about freedom of speech and that education is the basic right of every child.Young Women’s Christian Association (YWCA) national president Lucy Lungu said Zambia Cares Alliance is making a difference as Zambians are showing that the crisis in Nigeria is a Zambian problem also.Zambia Cares is an alliance of political and religious leaders, government and other political party representatives, civil society, the private sector, media practitioners and the United Nations in Zambia. The alliance arose out of a deep desire among Zambians of various backgrounds to react in some way to the plight of over 200 Nigerian girls who were abducted from their school in Chibok, Nigeria in April 2014.